The 5th edition of the International DHC + Summer School was organised in collaboration with EnergyVille, an association of the Flemish research institutes KU Leuven, VITO, imec and UHasselt in the field of sustainable energy and intelligent energy systems. 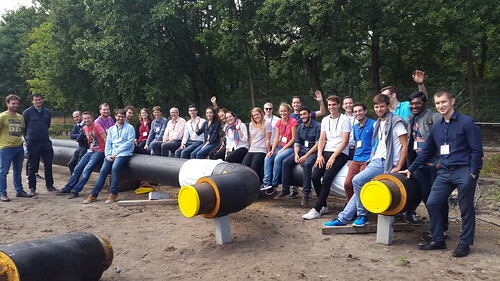 It took place from 27 August to 2 September 2017 and was a perfect occasion for students and professionals to explore the functioning of the newest installations for energy research in Belgium and participate in the discussions on district heating and cooling developement. These diverse lectures were combined with guided site visits to real installations, such as the newly developed district heating network Nieuw-Zuid Antwerp, the highly advanced 4th generation network Mijnwater in Heerlen, and the first deep geothermal well in Mol. The week in Belgium also comprised networking activities such as sightseeing, dinners, participants’ presentations and group work and allowed to create connections between participants, facilitate exchange of knowledge and explore business opportunities for the future. The DHC challenge was hosted by Mr. Ralf-Roman Schmidt (AIT Austrian Institute of Technology) and required participants to work together in small groups to conduct feasibility studies for district heating in or nearby Genk. Under the guidance of district energy experts from EnergyVille, representatives from the city of Genk and the province of Limburg, participants with different backgrounds shared their knowledge and came up with great ideas for the transition towards a more sustainable heating and cooling future in Flanders. If your organisation is interested in hosting the next edition of the Summer School in 2018 – please check the call for hosts and let us know before 1 November 2017.